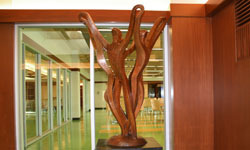 The oak sculpture Spring, which suggests five figures dancing in a circle, was created by Chaim Goldberg in 1976-77. 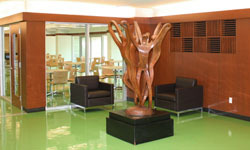 It stands inside the Houston Parks and Recreation Department headquarters in Gragg Park. Goldberg was born in 1917 in Kazimierz Dolny, Poland, and much of his art represents life there. He was graduated from the Jozef Mehoffer School for Fine Arts in Krakow and the Academy of Fine Arts in Warsaw. He attended the Ecole des Beaux-Arts in Paris and emigrated to Israel in 1955. He came to the United States in 1967 and became an American citizen in 1973. He died on June 26, 2004.